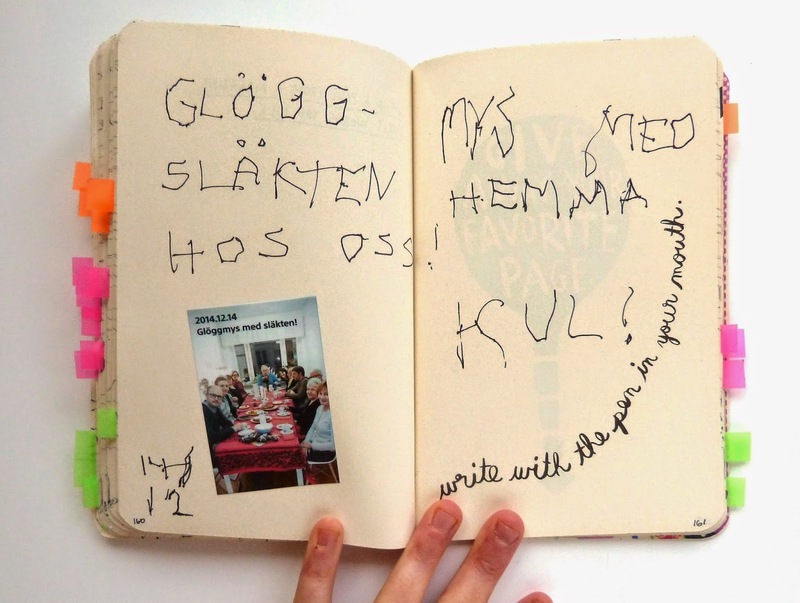 nordic craft: Wreck this Journal, NordicCraft style! 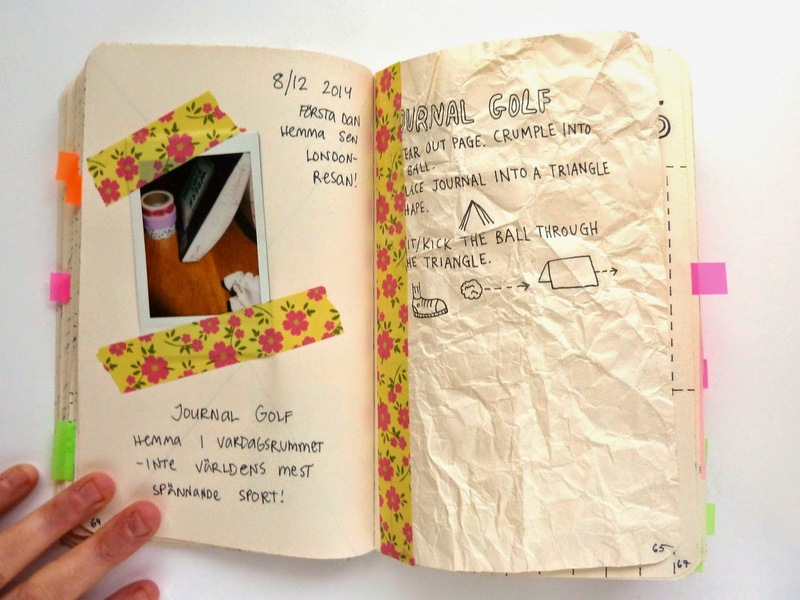 Wreck this Journal, NordicCraft style! There's still one thing from my London trip I haven't blogged about: I finally got a Wreck This Journal! I've been eying these creative journals by Keri Smith for years, but I always felt that it seemed frivolous to spend money on something I knew I would "wreck" in the end. But on our London trip I finally broke down and got one. And I know I'm a bit late jumping on the bandwagon, but I LOVE it! Wreck This Journal is a best seller in several countries from what I understand, but if you've somehow managed not top hear about them before, here's the lowdown: WTJ is a prompt journal which fuels creativity and challenges your inner perfectionist, forcing you to do lots of things you've been taught NOT to in the process. 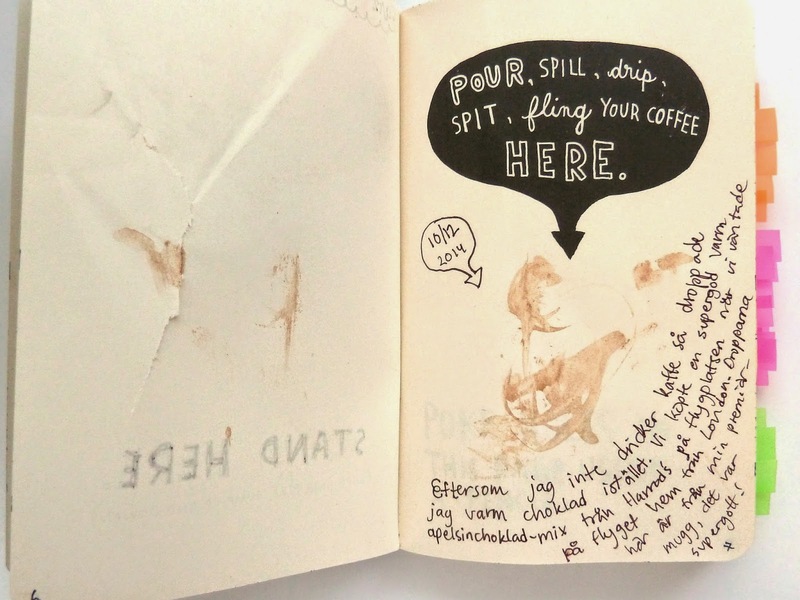 Each page contains a prompt, and examples include "Spill your coffee here", "Tear out this page", "Write backwards", and (this was one of the worst ones for me) "Color outside the lines". The idea is to get rid of some of those inner "controls" which temper your creativity and make you second-guess yourself. And it really works! I've been working on my journal on and off over the past two weeks. It was really challenging at first, forcing myself to do all sorts of destructive things to the journal. 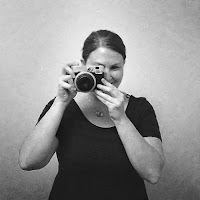 But once I picked up steam and managed to let go of my inner perfectionist, I really got into it. I think I've probably done at least a fourth of all the prompts already. I've jumped on my journal, brought it into the shower with me (yes, that's one of the prompts) and slept with it under my pillow. I love my new journal and I'm sure I'll be spending lots of time with it in 2015. And as I had hoped, working on the WTJ has really made me miss writing more regularly - I'm thinking of starting a "normal" journal this year as a result. So if you'd like to get those creative juices flowing in 2015, I'd highly recommend getting a Wreck This Journal for yourself, too!